It is both a great honour and pleasure to welcome You and Your delegation in Cyprus and for providing us with the opportunity to reciprocate the exceptional hospitality extended during my official visit to India last year. 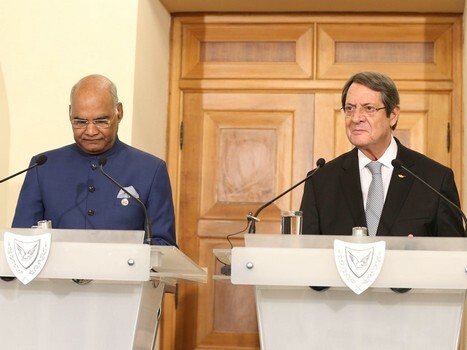 It is a well-known fact that India and Cyprus enjoy a long-standing deep-rooted friendship and ties based on shared values and mutually beneficial partnerships, both at the level of Government and of our two societies. This is a relationship which we greatly value and one which we jointly aspire to further reinforce and strengthen. In this respect, the exchange of visits at the highest level, the enhancement of our institutional legal framework of co-operation through today’s signing of Memoranda of Co-operation in the fields of Financial Intelligence and Environment, in addition to the four bilateral agreements signed during my visit on April 2017 in India, is a testament of our resolve to explore new areas of beneficial co-operation, as well as enhance existing ones, to the benefit of our countries and peoples. Today, we have held extensive consultations in an atmosphere of friendship and mutual understanding that traditionally characterizes the excellent level of our relationship. We discussed a number of issues in a wide spectrum of bilateral interest and identified specific areas on which we can work together to further solidify our partnership. In this regard, we agreed to establish a Ministerial Working Group to oversee the conclusion of pending bilateral agreements and ensure the optimum implementation of existing ones, particularly those in the fields of economy, merchant shipping, investments and tourism. We also explored ways and means of further enhancing our diplomatic dialogue within international fora. A dialogue which is based on our frequent and constructive exchange of views, based on our common vision and identical positions on crucial issues of the international agenda, particularly as regards tackling major global challenges, such as climate change, sustainable development, the protection of maritime environment, migration and international terrorism. To this end, we discussed the issue of the UN Reform, on which we agreed on the need to ensure that the Security Council continues to play an effective role in maintaining international peace and security as envisioned in the UN Charter. We also reaffirmed our support for the conclusion of a UN Comprehensive Convention on International Terrorism that advances and strengthens the framework for global cooperation, while, in line with our shared commitment to preventing the proliferation of weapons of mass destruction and their means of delivery, I expressed Cyprus’ continuous support to the application of India to join the Nuclear Suppliers Group (NSG). Additionally, we elaborated on further strengthening our cooperation within the framework of the Commonwealth, taking also into account the linked issue of Brexit. We also highlighted the importance of India as a strategic partner of the European Union and the significance of deepening this relationship. Cyprus is a firm supporter of the enhancement of the EU-India strategic partnership and within this context I expressed our sincere support for tangible progress in the negotiations for the conclusion of an EU-India Free Trade Agreement. At the same time, I informed President Kovind on the latest developments regarding the Cyprus Problem. I elaborated on the prospect of resuming the negotiating process and reiterated my unwavering commitment to reach a viable and functional settlement, in full respect to international law, the relevant UN Security Council Resolutions and the values and principles of the EU. A gratitude and appreciation which is also extended to India’s long-standing troop and police contribution to UNFICYP. In concluding, I wish to reassure you of my determination to further enhance the historically excellent relations of our two countries. Once again, I would like to warmly welcome you to Cyprus. I hope you will enjoy your stay in our country.